Yep, it's here, finally, the perfect horse pattern, realistic in every single aspect of it's anatomy. I have found that there are many horse patterns on etsy, but none are correct in every part, this one is! I have ridden and owned horses since age 4 so I had to make sure my pattern was just right. It contains dozens of photos for detailed sewing instructions. Also this horse is roughly the size of a Breyer horse, so most Breyer tack and riders will fit! 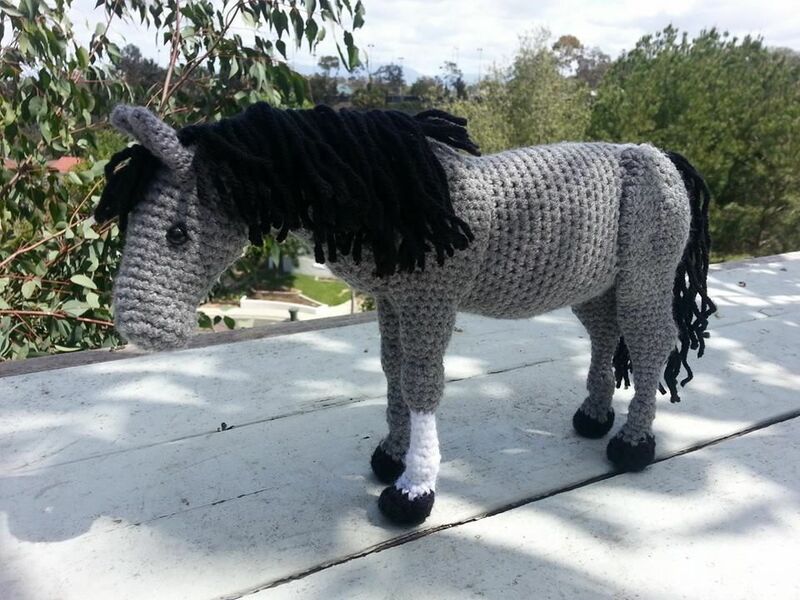 The horse has a style-able mane and tail that kids and adults will love. I'm proud of this pattern and it can be made in any color, bay, chestnut, gray, black or white. Use a yarn with a broken color pattern to make paint and pinto horses. This is a fairly advanced pattern, you are working in the round and must count and pay very close attention to every single row to make sure the sculpting comes out right. You must crochet tightly and with great control. The horse will not stand up without the wire in his legs. This pattern includes extensive instructional photos to help with assembly. This horse is roughly 1:9 scale to real life, (about 10-12 Inches tall. All of my patterns are scale-able meaning that if you use a larger yarn they will come out in the same proportion. You will need, Worsted Weight Yarn, Sport Weight Yarn (same color, this is for ears), 3mm crochet hook, 2mm crochet hook, scissors, tapestry needle, 6mm safety eyes, 20g wire, wire cutters, fiberfill or other stuffing.